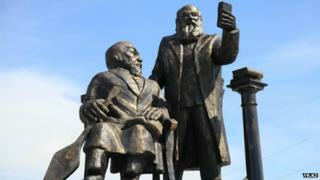 A monument in Kazakhstan has been hastily removed after locals likened the figures on it to hobbits taking a "selfie", reports say. The statue in the city of Ust-Kamenogorsk was built to honour two 19th Century figures - Abay Kunanbayev, a local writer and thinker, and Yevgeny Mikhaelis, a Russian scientist and pro-democracy activist who was exiled to eastern Kazakhstan. But it immediately attracted the scorn of locals who - according to Tengri News website - took to social media to point out that the figures looked like they were taking a selfie. Other people pointed out their similarity to hobbits, said the news website Nur.kz. Even one of the co-authors of the monument, Vladimir Samoylov, admitted that there was something wrong with it. The sculptors were given too little time to finish the monument, he told YK.kz, a website based in Ust-Kamenogorsk. "We were in a huge rush, and look what happened." Following the criticism, the monument was removed on 24 June, just one day after it was erected at the intersection of Abay Avenue and Mikhaelis Street. It "deviated from the agreed design", and the sculptors were told to correct the deviations as soon as possible, the local government told Tengri News.